For all of our challenge lovers, be sure to stop back on the 15th when we post our next challenge. New challenges are posted on the 1st and 15th of each month. We would love to have you join in. Today you will see some great projects using our November Ribbon Club Assortment from our very talented design team. They always come up with some super ideas. Isn't this assortment great?? It contains 8 styles and a total of 16 yards. If you aren't already a ribbon club member, why not join us today! You will get a fun new ribbon assortment shipped automatically each month. At the end of the hop, comment on this post answering the question below for a chance to win our November Ribbon Club assortment and the extra goodies shown below. What is the average number of desserts that show up at your family gatherings and what is you favorite? With Thanksgiving right around the corner, I've been looking for new dessert ideas. I'm the baker in the family and we all love dessert. We typically have no less than 7or 8 options, so that figures to be one full cake, pie or plate of cookies for every 2 people. Why even eat the main meal??? How about your family? Our winner will be selected from the numbered comments on this post on Monday, 11/19 using random.org. Be sure to check back on Monday evening to see if you are our lucky winner. First want to say fabulous hop! went to all the blogs that were listed but one didn't work and posted comments where it would let me. to answer you question: on thanksgiving I like to make the traditional pumpkin pie and a chiffon pumpkin pie which has become a favorite in my house. Awesome hop! There are about 4-5 desserts, of which pumpkin pie is my favorite! 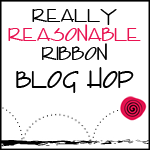 Fabulous blog hop--I'm inspired by so many clever designs and wonderful ways to use ribbon. RE desserts--required to have pumpkin pie and pecan pie. After that, my dd who bakes usually makes her famous chocolate chip cookies. She's been trying out some interesting pumpkin recipes for cupcakes so we may be seeing some new deserts. What great projects the DT created! Of course there has to be pumpkin pie! Always an assortment even though we try and cut back LOL Christmas eve I make profiteroles, with a different sauce each year. First let me say I was so impressed with all of the projects. I never thought of the black, grays, and reds for Christmas, but your designers have me rethinking my color schemes! As for desserts, well, we try to limit them to 4 of 5 and I would have to say my favorite is the bourbon cake. I only make it once or twice a year, but it's always a hit and a little goes a long way! Great hop, again! When it is just our family of 5, we always have pumpkin pie, chocolate pie, and I make pumpkin chocolate chip bread from a recipe my almost 21 year old son brought home from preschool when he was 3! It's my kids favorite dessert EVER. In years past, it was 3 desserts, but we since we end up sending most of them home with my brothers, we decided on one dessert--cheesecake, which my brother is bringing to us. This was my first hop and I loved it. We average about 5 desserts! But my favorite is Sweet Potato Pie that my awesome husband makes from scratch. It is to die for! I would say the number of desserts range from about 6-10, depending on the number of guests that show up. Most of the desserts aren't even touched. However, the big hit is a chocolate mint pie. It is the easiest dessert served, and the first to be gobbled up. I would have to say an average of 3-4 desserts. My favorite is...ALL of them! :) But I do love pecan pie! What a great hop! Loved all the DT fabulous creations and how they used their ribbon! Hmmm, we have an average of two deserts, usually pie, and cherry pie is my favorite. Which is interesting because when I go to potlucks or other peoples get-to-gethers, someone usually has brownies there and those are my absolute fav's! For some reason, I cannot make a good brownie though. lol. I went to all the hops, what a wonderful time I had seeing all that can be done with the ribbons. The average number ofdesserts at our table for Thanksgiving are 2, apple and pumkin pie, but this year I am adding a 3rd and making pumkin roll as well. My favorite will the pumkin roll. I have made it before but not for Thanksgiving until now. Thanks for the great hop! Fabulous ideas in the blog today and have to try that ribbon tree for sure. Family gatherings and desserts -- oh gosh the more than merrier I say. We love pumpkin cheesecake and apple/cranberry pie (with a cinnamon crumb topping)at this time of year. Always home made.If it is sweet I will eat it. Great hop, y'all! Thank you, Bonnie for being so on top of things - you rock! This was my fist hop and must say that I am inspired to get busy now! What beautiful things they all have made. As for the desserts... We always have the traditional pumpkin and sweet potato pie (always up for debate as to which is better ; ) ) and we also have a four layered chocolate dessert in memory of my mother-in-love as this was her most favorite. We usually eat in the mid afternoon and then play some games and then have dessert several hours later. Wow, such gorgeous projects! I love all of the inspiration! As far as desserts, we might as well have them as the main dish. We all have a horrible sweet tooth in my family. Being East Indian, there are so many different options when we mix the Indian and American cultures. I love them all and don't generally turn anything sweet away without at least a tasting of it! Such a great hop! Love the variety of projects everyone shared! Our Thanksgiving dessert table is usually filled with different kinds of pies, however I have to say I am always drawn to the pumpkin! I will eat a small slice of cherry and maybe a little apple but that slice of pumpkin is always a bit larger than the rest and always topped with a dollop of whipped cream...yum! During the end of year holidays it is pumpkin pie, apple pie, and cheese cake. I usually pick the cheese cake. Fabulous blog hop - thanks to the DT for all their inspiration.Can't wait for my next ribbon club package! Amazing hop and that ribbon is gorgeous...thanks for the chance to win! Our dessert table is full of the regular pies, pumpkin, pumpkin custard and apple, but we also enjoy, pumpkin bars with double cream cheese frosting, hershey syrup brownies and lemon bars...we are an equal opportunity sugar high family! Our family is pretty small, but we still have 2-3 desserts. My favorite is either cheesecake or white cake. When I received my pack of ribbon this month I was blown away!! Loved the colors and now through this hop I have some great ideas. Thank you!! To answer your question, we have a separate table each year just for desserts. It's always full but my favorite is Pecan Cobbler. My mouth is watering with just the typing of those letters. Happy Holidays to all from me here in South Alabama!! Great hop. I enjoyed all the beautiful projects. Great work by the DT members. Loved everything. 2 or 3 desserts manage to show up at gatherings. I have to say that my favorite has to be a frozen Chocolate cheesecake dessert. Love it. We go to Mimi's Cafe for our Thanksgiving dinner so there is always two deserts. I love pumpkin pie, but am allergic to it, so I have to have whatever else is available, love Coconut Creme pie! We usually have a pretty small gathering, so only 1 or 2 desserts. I love anything pumpkin, so Pumpkin Cake or Pumpkin Pie would be my favorites! Great blog hop! We usually have 3-4 pies, plates of cookies and maybe some homemade candy. Great hop! We have lots and lots of sweets at family gatherings! Everybody's sweet tooth is satisfied! we get together with family early in the day and then with our neighbors in the evening. There are too many deserts to name, but my favorite iwill always be pumpkin pie! great hop!